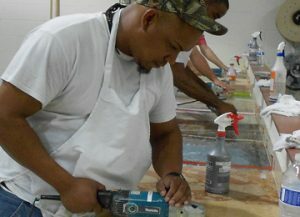 This course is two full days of intensive training on how to restore and refinish natural stone and quartz (engineered stone) countertops, as well as walls and showers. The majority of both days will be spent doing hands-on training, with some classroom lecture time. You will gain the experience you need to service your residential customers, as well as commercial and hospitality jobs, such as restoring hotel vanity tops and shower walls. This course will prepare you to tackle these jobs with confidence. Each class is limited to five students, so there will be plenty of opportunities to ask questions and get individual feedback. You will have your own tools to work with and your own work space, as well. I liked that the instructors were very professional and at the highest level of expertise. Very informative and a great investment. I liked everything about these courses. Coming to this school is by far the best investment i've made thus far for my business. Thank you John and Butch. See you guys hopefully in May. It was a lucky day when I came across your marble and stone restoration school on line. It’s been only 1 week or so, that I graduated in your school and now I am having meetings all over in Washington DC with high end commercial property management and real estate Agents. It’s amazing the confidence I gained in your school in only 5 days. Doors are opening up left and right.I am looking forward to come back to your school to complete the rest of the classes.Ps; BTW I love your teaching style ! Less talk, lots of action!! !